Today we feature a guest post from Clare, who is a passionate Canadian and hockey fan with strong opinions on Daniel Alfredsson. She attended his retirement ceremony last night and, through her watery eyes, wrote this for us. Alfie’s departure from Ottawa in the summer of 2013 was… we’ll go with ‘fraught.’ It was a lot of things, from unexpected to heartbreaking to confusing to something close to a betrayal. That sounds melodramatic, but in the theatre of sports emotions it’s not far off. He meant an extraordinary amount to the team and the city as Alfie the player and the person, but also Alfie the myth. Not myth as in a lie, but a myth as something larger than some Swedish dad with a dorky haircut. He was a #leader, a [Don Cherry voice] HUMBLE, HARD-WORKIN’ BLUE COLLAR KID*** who gave back to his community, a sixth-round pick who became a franchise’s greatest player, a supporter who put his money where his mouth was, a skilled player who never gave up and came through when it mattered. All of that was true – and it remains true. I had already mentally given up on the Sens-Pens 2013 second-round series, and was half-heartedly watching it while packing for a tournament. I snapped to attention just before his tying goal, and let out a howl of delight**** that drew everyone else in the house – including a cousin of Sidney Crosby’s, because there’s legitimately only about 80 Canadians in existence – into the room to crow in renewed vigour. Last night, you’d never know our notoriously “finicky” fanbase***** had ever reeled. My group was late to the game******, so I sprinted up the stairs to burst into the 300s just as he took the ice for warm-ups: awful haircut bared, shoulders big and strong, C on his chest. Same as it ever was. Every single person stayed on their feet for warmups. There was some chanting, and an explosion of noise when he burst into a drill for a one-on-one with Anderson, but everyone was mostly just watching, giddy and happy. 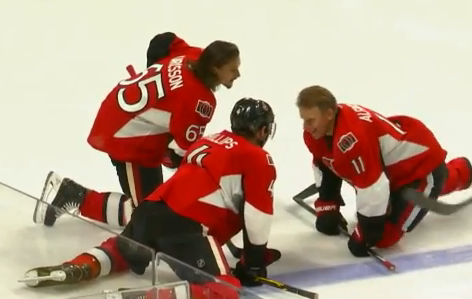 Nobody appeared more genuinely thrilled than Erik Karlsson, the happiest puppy to ever stretch his hip flexors. Erik Karlsson and Alfie were close: EK lived with Alfie, talked with him once a week during Alfie’s 2013 Walkabout Tour, took transparently joyous selfies with him in Sochi, and called him for 40 minutes after he was offered the captaincy. During warmups, it was Alfie wearing the C, and EK’s chest was blank. 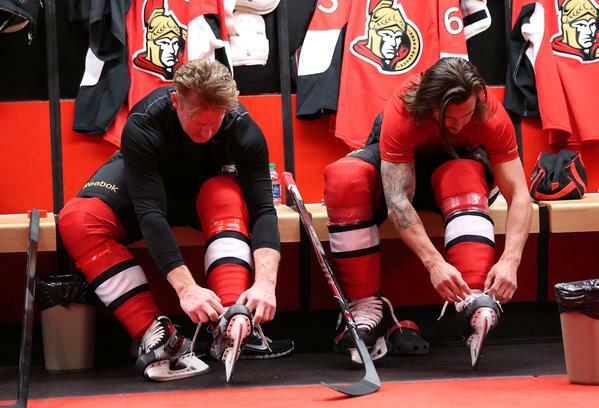 “The kids cheer for whoever wins,” Alfie said of his four young boys, all of whom emerged wearing EK65 jerseys – little Cs firmly affixed – for the ceremonial faceoff. It was the loveliest of gestures and a gentle push for all of us to keep moving into a new era of Senators hockey (known henceforth as the Reign of #EK65, First of His Name). Alfie had some fantastic moments with the franchise – from his 2007 ECF overtime goal to his 400th goal (although I think EK was more excited about that than anyone else), but amid all the lionizing, it’s usually forgotten or glossed-over that he wasn’t always so beloved. We may be standing outside his door with a ‘to me you are perfect’ placard now, but his leadership was often called into question, and management frequently played hardball with contracts.He wasn’t really anyone’s first choice (and, on one occasion, wasn’t anyone’s second to one-hundred-and-thirty-second choice, either). 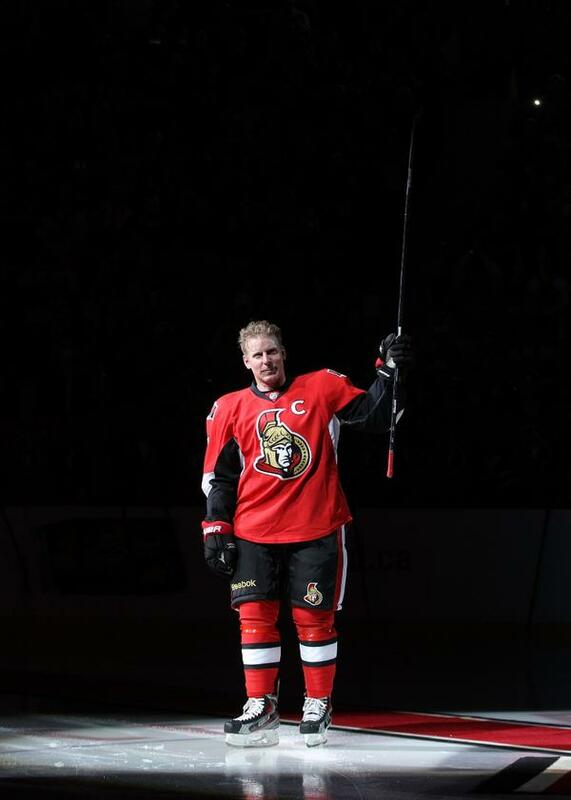 But for many Ottawa fans, Alfie was their favourite player; in letting him go, you bid farewell to many memories, pieces of your childhood or of growing up, and a huge part of what made watching hockey special. The Senators don’t have Cups (or a long and storied history… or multiple conference finals…. or playoff wins against our closest rivals…). But we had a great player to call our own, and a good man to call us his. My eyes stayed remarkably dry throughout warmups, too caught up in the sheer pleasure of watching him take sure, steady strides across the ice and lead the whole team in a game of keep-away as though they were a Timbits soccer team. We were a frozen cornfield full of love for him last night, and he deserved every clapping breath of it. –When A Captain Walks Away – Shannon Proudfoot, Sportsnet (13/07/13). On the myth of Alfie and why it hurt so hard when he left. –Email Hot Stove: Alfie – Silver Seven Sens (04/12/14). 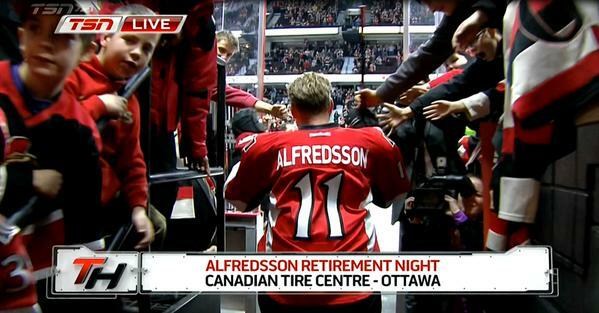 Silver Seven writers sharing their favourite Alfredsson moments. –Daniel Alfredsson Returns – Amelia L, Silver Seven Sens (30/11/13). By day, Clare Hutchinson works for the betterment of mankind. By night, she coaches a game based on a children’s book series. She’s also a fan of hockey and more specifically Erik Karlsson. She can be found on Twitter at mcollinknight. Editor. Writer. Photographer. Knitta 4 Life. Oh my God, Clare, amazing piece.